Introductions to the theory of knowledge are plentiful, but none introduce students to the most recent debates that exercise contemporary philosophers. Ian Evans and Nicholas D. Smith aim to change that. Their book guides the reader through the standard theories of knowledge while simultaneously using these as a springboard to introduce current debates. Each chapter concludes with a “Current Trends” section pointing the reader to the best literature dominating current philosophical discussion. These include: the puzzle of reasonable disagreement; the so-called “problem of easy knowledge”; the intellectual virtues; and new theories in the philosophy of language relating to knowledge. Chapters include discussions of skepticism, the truth condition, belief and acceptance, justification, internalism versus externalism, epistemic evaluation, and epistemic contextualism. 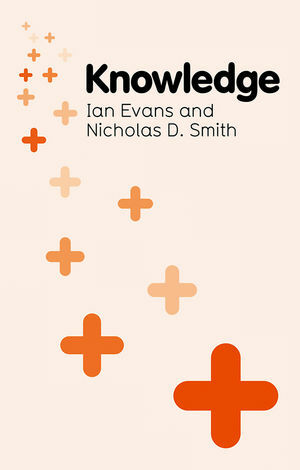 Evans and Smith do not merely offer a review of existing theories and debates; they also offer a novel theory that takes seriously the claim that knowledge is not unique to humans. Surveying current scientific literature in animal ethology, they discover surprising sophistication and diversity in non-human cognition. In their final analysis the authors provide a unified account of knowledge that manages to respect and explain this diversity. They argue that animals know when they make appropriate use of the cognitive processes available to animals of that kind, in environments within which those processes are veridically well-adapted. Knowledge is a lively and accessible volume, ideal for undergraduate and post-graduate students. It is also set to spark debate among scholars for its novel approaches to traditional topics and its thoroughgoing commitment to naturalism. Ian Evans is a graduate student in philosophy at the University of Arizona. Nicholas D. Smith is James F. Miller Professor of Humanities at Lewis and Clark College. His many books include Socratic Moral Psychology and Plato's Socrates. "An extremely accessible and up-to-date introduction to epistemology that canvasses a host of epistemological hot topics." "This book is a much needed up-to-date introduction to the central issues in epistemology. Its lucid and lively prose is ideal for introducing students to the concerns of the epistemological vanguard." "In this eminently readable book, Evans and Smith provide the most up-to-date introduction to the analysis of knowledge on the market. If you want to be on top of current and future trends in epistemology, read this book." "This is a fine introduction to epistemology. Well informed, interesting, and clearly written, it makes recent debates lucidly accessible to beginners." "Detailed, subtle, and sophisticated, this book does an excellent job discussing many of the central issues in traditional epistemology."